OPEN STUDIO – Oct. 22, Sunday, noon – 5 p.m. Visitors will have a chance to try their hand at Japanese sumi-e ink painting, have some refreshments, visit our greenhouse and buy our sumi-e prints and cards. We’ll also have our Arlington/Falls Church/DC digital photos and cards for folks to browse through, too. 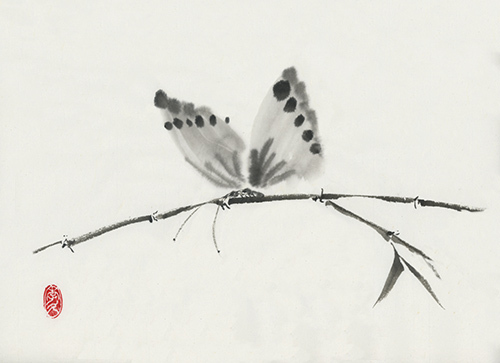 Here’s one of my favorite sumi-e paintings that I’ll have available as prints and cards. I do the original on mulberry paper, then scan it and print in various mediums.